Harry Potter may be an orphan, but that doesn’t mean he’s entirely without parental figures. As part of our Mother’s Day post last month, I talked a bit about the awesome mother figure of Molly Weasley. Today, in honor of Father’s Day, I want to recognize four of the men who filled the role of “Dad” in Harry’s life, as well as Harry’s own late father, James Potter. The gentle giant Rubeus Hagrid has looked out for Harry from the very beginning. It’s Hagrid who brings the news that Harry is a wizard (Yer a wizard, Harry!) and escorts him to his first year at Hogwarts School. During that first year, Hagrid keeps careful watch over Harry, helping him adapt to the unfamiliar wizarding world. Typically, parents or grandparents take young wizards shopping for their school items in Diagon Alley; because Harry has no wizarding relatives left, it’s Hagrid who steps up to ensure Harry lacks nothing. When all the other students receive letters from the families, Hagrid sends mail to Harry so the boy won’t be left out of the owl deliveries. As groundskeeper at Hogwarts, Hagrid doesn’t have much, but he happily opens his home to Harry whenever the young wizard needs him. Although Rubeus Hagrid is known to bungle situations, he tries his best to offer advice when Harry needs it. No matter what, he has full confidence in the Boy Who Lived and remains a faithful friend and his own clumsy father-figure. Mr. Weasley is the complete opposite of Harry’s Uncle Vernon. After spending years in Uncle Veron’s household, I imagine Harry’s impression of father figures wasn’t a favorable one. 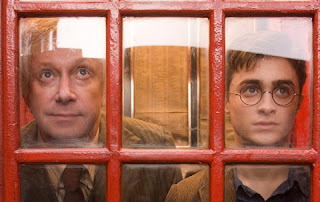 Uncle Vernon was impatient, churlish, inconsiderate, stuffy and overbearing; Arthur Weasley exhibits none of those traits. Instead, he is easygoing, friendly, thoughtful, clever, and downright fun. Although Mr. Weasley has six seven (I missed one initially. Oops.) children of his own, he never hesitates to welcome Harry into the family. He even takes Harry along on family outings, such as the grand Quidditch World Cup. Like Hagrid, the Weasleys are far from well-off, but Arthur and his family are rich in spirit. Mr. Weasley works hard to take care of his family and is fiercely devoted to them, willing to do anything they need and extending this love to Harry. Although the books don’t say, I think it is thanks in part to Mr. Weasley that Harry later turns out to be an excellent father. Arthur was Harry’s first example of a good father, and I believe his kindness and faith in Harry helped shape the Boy Who Lived into a great man. 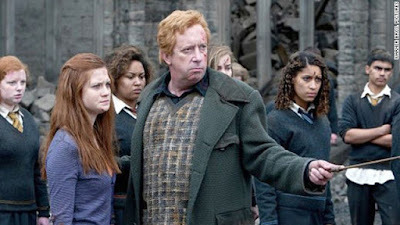 As a bonus, Mr. Weasley becomes Harry’s true family years down the road when Harry marries Ginny Weasley, Arthur’s daughter. Remus Lupin makes his first appearance in the third book, as the new Defense Against the Dark Arts Professor. He’s far more than a teacher, though. From the start, Lupin watches over Harry, jumping to his defense at a moment's notice. The mild-mannered professor spends extra time tutoring Harry, ensuring that he’s able to defend himself. Remus is encouraging and diligent, never expecting anything in return for his help. When it’s revealed that he was best friends with Harry’s late father, we see how deep Lupin’s loyalty goes to the Potter family. 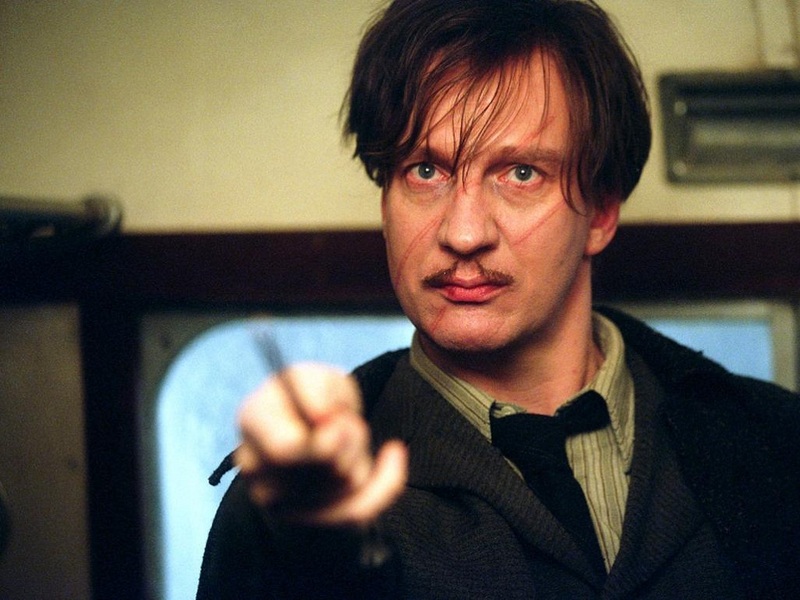 Remus offers wisdom and occassionally tough lessons, correcting Harry when needed and being the voice of reason. The professor isn’t perfect, but he acknowledges his mistakes and strives to limit them. He avoids the spotlight, preferring to go unnoticed; however, he’s willing to jump into the middle of any situation to help Harry. 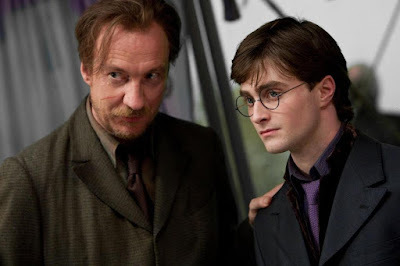 Remus deeply loves his late friend’s son, even asking Harry to become part of the Lupin family as godfather to Remus’ son. The stories, and Harry’s life, wouldn’t be the same without Remus Lupin in them. (I’m going to stop there, or else this will turn into an even longer post about how awesome Remus Lupin is. That can come later.) One last thing: Remus always carries chocolate. Major dad points for bringing food! Next on my list is Harry Potter’s godfather, Sirius Black. Sirius also arrives in the third book, although under far different circumstances than Lupin. I won’t summarize the twists here; suffice it to say, Sirius was inseparable friends with James Potter and Remus Lupin, too. He was present for much of Harry’s early childhood, before tragedy left Harry orphaned. It was Sirius who bought Harry his first broomstick, and more than a decade later risks a great deal to send Harry a top-notch Quidditch broom. Despite being separated from his godson for a dozen years, Sirius has never forgotten Harry and will go to any lengths to take care of him. 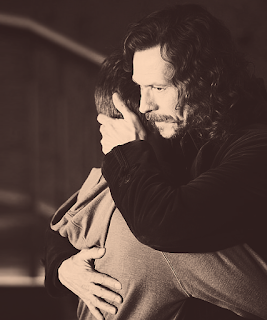 Sirius Black is Harry’s closest connection to his father, and the man manages to be a blend of friend, awesome uncle, and dad to Harry. Though Sirius can be a bit impulsive and reckless at times, he would do- and does- absolutely anything to protect his godson. He helps fill a void in Harry’s life, making himself as available as possible and doing the best he can with his teenage godson. He understands Harry better than most people, allowing Harry freedom to grow while trying to keep his godson safe. After years of feeling out of place, Harry finds a home and his own little family with Sirius Black. Aside from Harry’s own parents, I think Sirius loved and worried most about the Boy Who Lived. Although there wouldn’t be much of a story had James Potter survived, I can’t help but wonder what Harry’s life would have been like with his dad. 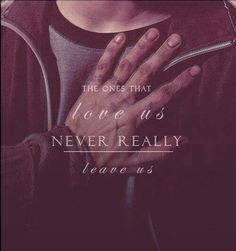 From the stories Sirius and Remus tell, and James’s ultimate sacrifice, we know how profoundly James loved his son. To James, Harry was more important than life itself. 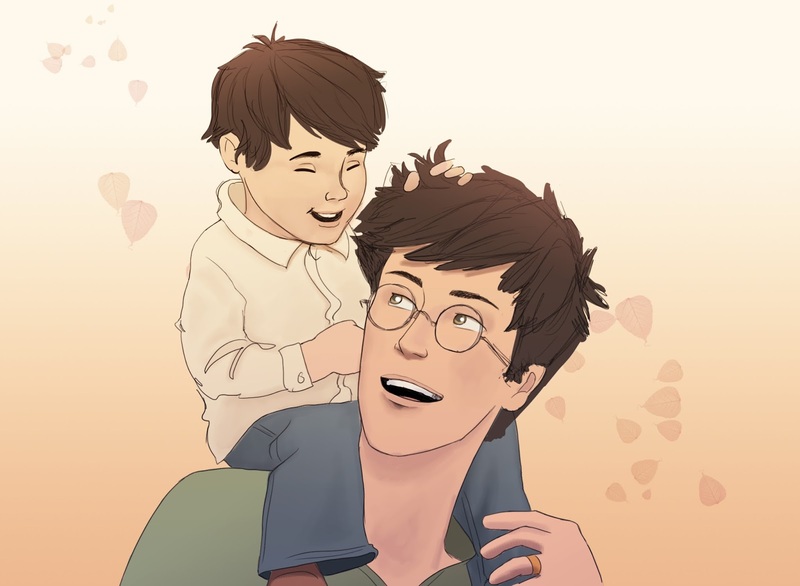 However, if James Potter had been able to go through life with his only child, he would have been both Harry’s best friend and greatest teacher. James possessed so many wonderful, fatherly traits: intelligence, a sense of humor, life experience from which to draw advice, confidence, courage, and unwavering love. He was also quite good at Quidditch, and considering he was a pro at managing mischief, one can only imagine the adventures he and Harry would have shared. So there you have it! Father’s Day is probably just a Muggle Holiday, but Happy Father’s Day to these Wizarding fathers and father-figures anyway. Who are your favorite fathers or fatherly wizards in the Harry Potter series? ?